Our Scotland Chair, Maureen McGinn, has the privilege of getting out and about to meet projects up and down the country. Here’s what she had to say about a visit to a very special housing development in Edinburgh. At the Big Lottery Fund we spend a lot of time thinking about how best to support communities – it’s embedded in our programmes and is part of our mission. You might say it’s in our DNA. But how do you go about creating a new community? recognised that for a development to promote physical and mental well being it needs more than well designed and well built housing, it also needs a sense of community. And so they devised ‘Outdoors Matters’ their plan to support the creation of a new, welcoming, connected and integrated community. With the help of £356,000 of Lottery funding, an elegant garden room was built to act as a focus of activity within landscaped space. In addition, they have appointed a community capacity builder who, with other staff, will work closely with residents to develop the physical space and also a programme of activities to ensure people remain connected. I recently had the pleasure of attending at the official completion of the development along with Margaret Burgess MSP, Minister for Housing and Welfare and other guests. 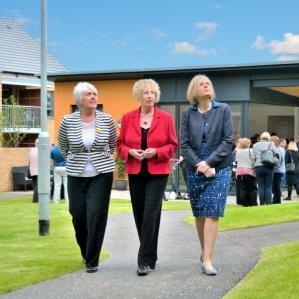 This development sits well with Scottish Government ambitions to develop new models of housing for older people. We viewed the dementia friendly designed, and Wi-Fi enabled houses with their district heating system. Each house has access onto the evolving and very engaging open space with the attractive garden room at its heart. Charlotte Swarbrick, the community capacity builder, welcomed us in to that space. Although Charlotte has only been in post a few months, she is recognised and greeted by everyone. There was also a distinct sense of warmth and connection as people gathered in the Garden Room, talking about activities, such as Tai Chi or art therapy, planned over coming months and how they will be getting involved. Castle Rock Edinvar want Fortune Place to act as a model for inclusive affordable homes for older people with a culture of caring rather than being cared for, through supporting people to remain active and engaged in their community. It may still be early days but Fortune Place looks to be on track to achieve all that and more.